This Bookreporter.com Special Newsletter spotlights a book that we know people will be talking about this spring. 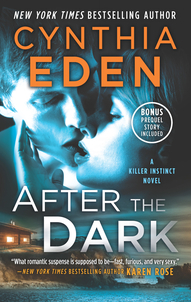 Read more about it, and enter our Spring Preview Contest by Tuesday, March 28th at 11:59am ET for a chance to win one of five copies of AFTER THE DARK: A Killer Instinct Novel by Cynthia Eden, which releases tomorrow. Please note that each contest is only open for 24 hours, so you will need to act quickly! In this gripping new series by New York Times bestselling author Cynthia Eden, a disgraced FBI profiler must save her reputation by stopping a sadistic killer she knows all too well. Now an all-too-familiar killer is hunting once again. She can catch the cunning assassin, but that means putting her trust in her former partner, Blake Gamble. Ex-military, Blake is tough, protective, precise. With her entire life on the brink, she knows he wants her back in the FBI…and possibly more. But someone else wants her, too. A threat is waiting in the dark, a killer who has set his sights on the ultimate trophy victim --- Samantha. - Visit Cynthia Eden's website and Pinterest. - Connect with Cynthia Eden on Facebook and Twitter.